ARIZONA BOUND (‘41 Monogram) Filmed in Prescott, AZ, the summer of ‘41 saw the first of one of the most beloved and well-remembered B-western series ever made. 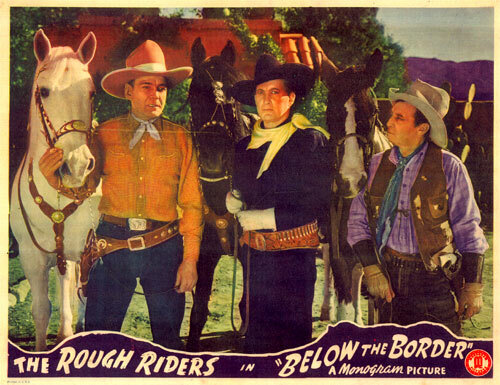 The Rough Riders (Buck Jones, Tim McCoy, Raymond Hatton) was the inspiration of producer Scott Dunlap to star two legendary B-cowboys in a series with a well known sidekick. Monogram, in need of a strong series, bought the premise and eight Rough Riders features were made before, with the onset of WWII, Colonel Tim McCoy, a long-time reservist, was placed on active duty. 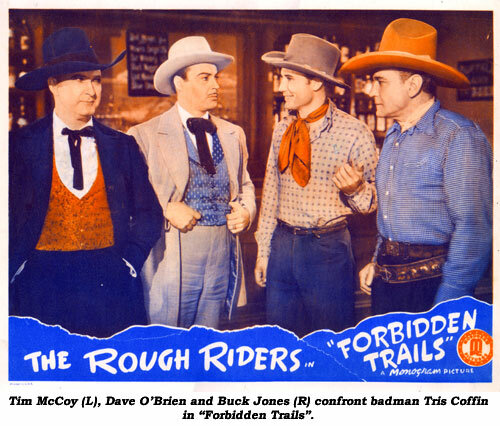 Although there had been trio westerns before (3 Mesquiteers, Range Busters), the Rough Riders created the concept of two former stars co-starring together. 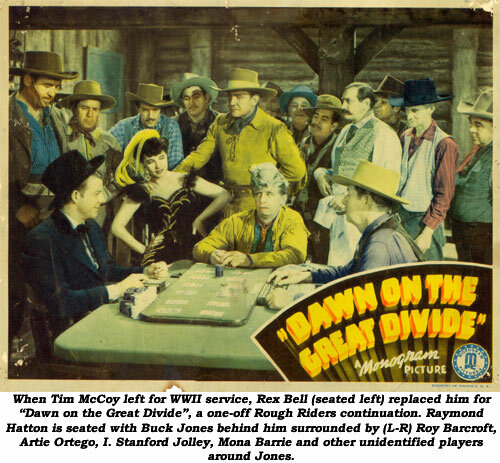 The idea was repeated by Monogram with Ken Maynard/Hoot Gibson (and later Bob Steele) as the Trail Blazers, James Newill and Dave O’Brien (and later Tex Ritter) as The Texas Rangers, even Republic joined Tom Tyler with Bob Steele in their Three Mesquiteers series when Livingston left the second time. Screenwriter of all eight Rough Riders entries, Jess Bowers’ story here has Buck drawn from retirement on his ranch to go to the lawless town of Mesa City, overrun by saloon owner Tris Coffin and his hired gun-throwers. Luana Walters’ stageline is being plagued by holdups, more than her sweetheart Dennis Moore can handle. 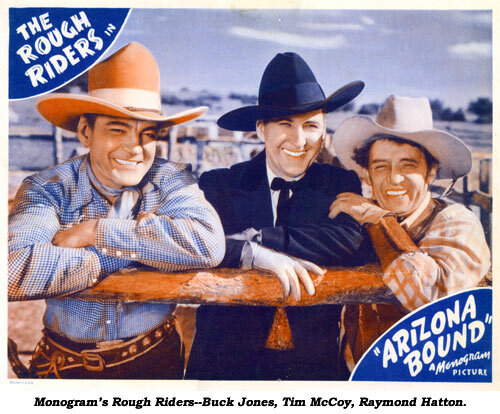 Joining Buck are McCoy (posing as a Sky Pilot) and Hatton as a cattleman. The first half is a bit slow as the characters are established, but the second half literally explodes as Buck goes to chewin’ gum and the Rough Riders ride again! Watch for another former star, Bob Baker, at the tail end of the picture as Sheriff Bat Madison. GUNMAN FROM BODIE (‘41 Monogram) Possibly the best of the eight Rough Riders titles as Buck, impersonating badman Bodie Bronson, and Marshal McCoy bust up a gang of rustlers. 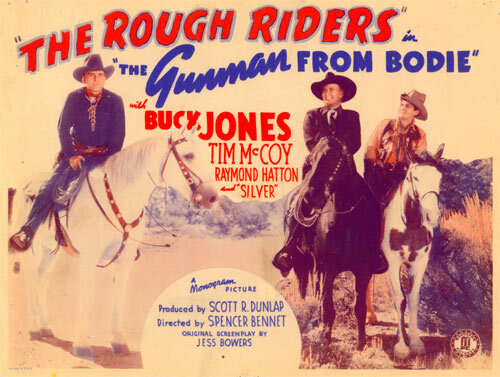 Commonly known as “the one where Buck finds a baby at the start of the film,” the plot was reworked in ‘45 for Jimmy Wakely’s “Riders of the Dawn” and the Texas Rangers’ “Gunsmoke Mesa” in ‘44. McCoy’s scene in the bar where he scares the bejesus out of a nervous John Merton by painstakingly describing in detail how they hang a killer is a classic. Foreman Dave O’Brien sings to (and smooches) leading lady and ranch owner Christine McIntyre but his voice is dubbed by an unknown singer. Anyone care to venture a guess who might have done the vocal for Dave? FORBIDDEN TRAILS (‘41 Monogram) One of the best of the series gets the action rolling at the outset, placing Buck in a burning shack besieged by gunmen. Town boss, Tris Coffin, is trying to force young Dave O’Brien into hauling high grade ore.
BELOW THE BORDER (‘42 Monogram) The Rough Riders ride again to clean up a gang of rustlers and thieves. Saloon owner Roy Barcroft blackmails Dennis Moore, the manager of Linda Brent’s father’s ranch, into using the rancho as a rustler’s hideout. Moore threatens to expose them when he learns they stole Linda’s jewels, as he is engaged to marry Linda. 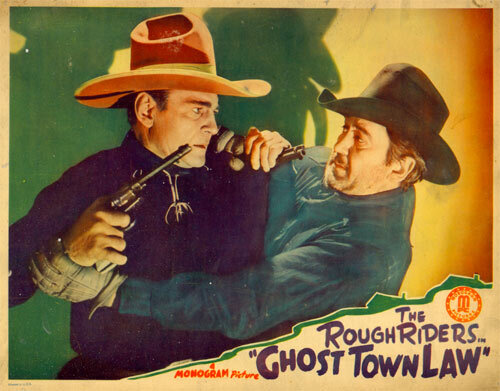 GHOST TOWN LAW (‘42 Monogram) Shadows, gravestones, spiderwebs, hidden tunnels, masked figures, secret passageways in a well, and mysterious threatening notes all held together by sinister Edward Kay music make this Rough Riders entry more of an old dark house mystery than a western adventure. Buck, Tim and Hatton suspect a judge of plotting nefarious deeds in his scheme to gain control of an estate owned by Virginia Carpenter and her brother where a lost vein of gold runs underneath the spooky old mansion. Okay, but probably the last Rough Riders title I’d select as representative of the series. Jones doesn’t utter a word til about the 25 minute mark. 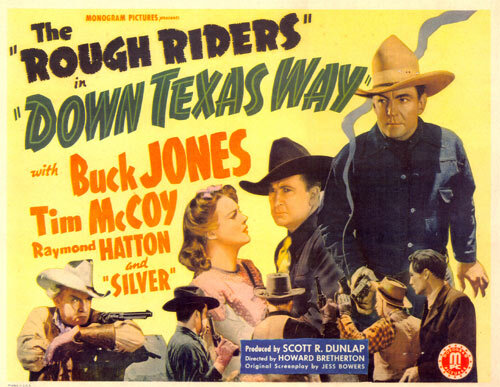 DOWN TEXAS WAY (‘42 Monogram) The trail blazes with action as the Rough Riders head down Texas way to clear their pal Raymond Hatton of a phony murder charge. Citizens suspect Hatton because he’s disappeared. Actually, he’s being held captive by Harry Woods’ gang in an effort to divert suspicion to him. 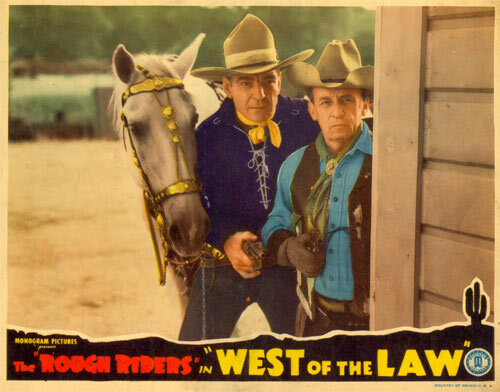 Remade as Johnny Mack Brown’s “Western Renegades” (‘49). 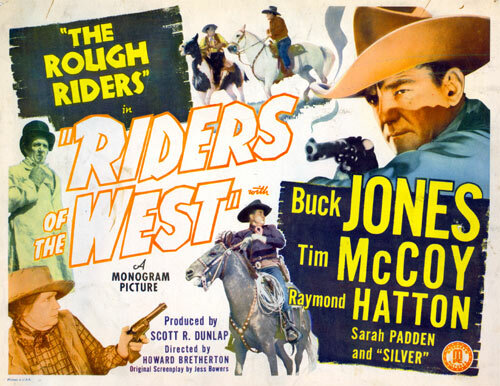 RIDERS OF THE WEST (‘42 Monogram) As William S. Hart said, “The thrill of it all!” And it still thrills today to see Jones and McCoy riding in tandem to the exhilarating Edward Kay Rough Riders music. But anyone who believes Jones/McCoy and Hatton were equal in this series, take a closer look at the on-screen credits. You’ll find Buck’s name larger than McCoy’s and Tim’s slightly larger than Hatton’s. In print ads Jones’ image is always larger…some ads don’t even show Tim. A banker, saloon owner, a rancher, the sheriff and a gunman are in cahoots to take over the whole valley. Feisty, fire-breathing Sarah Padden (in the type of role she relished—and she never did it better than here) sends for the Rough Riders! WEST OF THE LAW (‘42 Monogram) Outlaw Terror Sweeps Gold Creek! Bandits Steal Gold Shipment! Rustlers wipe out Diamond D Stock! Send in the Rough Riders to rout out badmen Harry Woods and Roy Barcroft. Now there’s a pair to draw to! The last of the eight Rough Riders films sags midway with too much nonsense about coffins and has a bit of a weak wrap-up. An unfitting finale to a beloved series of B-westerns. Hard to say how much the rousing Rough Riders themesong contributed to the success of this popular series, but it is immensely well remembered today.